Police said a woman was jumped and robbed in Lincoln Park on Saturday evening just two blocks from a convenience store that has been held-up twice this week. 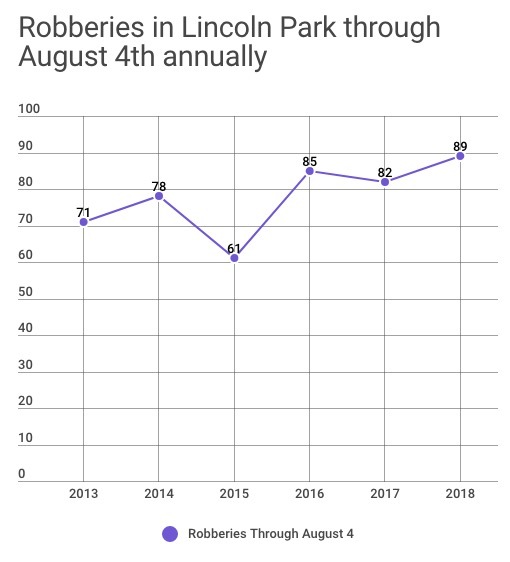 The report comes as Lincoln Park's robbery rate in 2018 is outpacing any recent year. The woman was outside of the Walgreens at 1520 West Fullerton around 7:30 p.m. when two men shoved her and took her iPhone and brown Coach wallet, police said. The duo then ran to an alley behind the 1400 block of Fullerton where they jumped into a waiting car, according to a witness. Police said the offenders were both black men with hoodies pulled tightly around their faces. One hoodie was black, the other was blue, they said. The men were last seen driving eastbound in the alley behind Fullerton and then southbound. 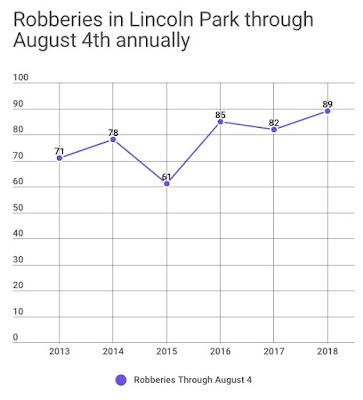 According to crime statistics released on the city's data portal, 89 robberies were reported in Lincoln Park through August 4th of this year. That's the highest number of hold-ups for the time period in at least five years, the data show. About two blocks from yesterday afternoon's robbery scene, the 7-Eleven store at 1349 West Fullerton has been robbed twice since last Monday. Around 3:30 a.m. on August 11th, a masked man walked into the convenience store and implied that he had a handgun. The offender took money from the register as well as cigarettes before running away southbound on Wayne Avenue, according to the store clerk. Police said the robber was black, about 5’7” tall, and 120 pounds. He was wearing all black and carried a black garbage bag. Then, just after 1 p.m. on Friday, a man entered the same store, displayed a handgun in a plastic bag, and gave the clerk a note that demanded cash according to police. After collecting the store’s money, the man ran westbound on Fullerton Avenue. He was described as a mixed-race man with light skin who is in his 30’s. He wore a black baseball hat with white writing on the front, a black do-rag under the hat, a white t-shirt, black pants, and black gym shoes.